Marie Skłodowska Curie was a fighter. During the course of her life: she struggled with depression just after high school; attended a clandestine institution for higher education because women were not allowed at regular institutions; she gave up education to sustain her sister studies; once she had enough fundings to move to Paris to study, she would faint from hunger because of the little resources left. All the while keep educating herself. She graduated in Physics, and she continued to get a second degree. Even when her career started blooming with her first studies with Pierre Curie, she was denied a job in Poland when she wanted to go back to her own country. In Paris, she and Pierre discovered and compiled a list of elements that emit radiation, like Polonium and Radium. They coined the word “radioactivity” and she was the first woman to be awarded the Nobel prize. Despite the recognition, she still had to fight xenophoby and accusations while in France. The Curie’s lab was no more than a shed repurposed for their studies when they started. With no ventilation and no safety equipment. They had no idea of the poisonous effect of radiation. While Pierre died years before on a road accident, Marie died from aplastic anaemia, very likely due to her exposure to radiation. Marie Curie was a fighter. And an example. A real superhero. She put her education and the pursuit of knowledge above everything else. Every time I feel low, every time I forget why I am doing science at all, every time the failures and the neverending challenges seem unbearable, I think of Madame Curie. I think how much she believed that science can help make a better world. So much that she displaced every odds life put in front of her path. And I draw inspiration to keep going and make it through a poisonous time. 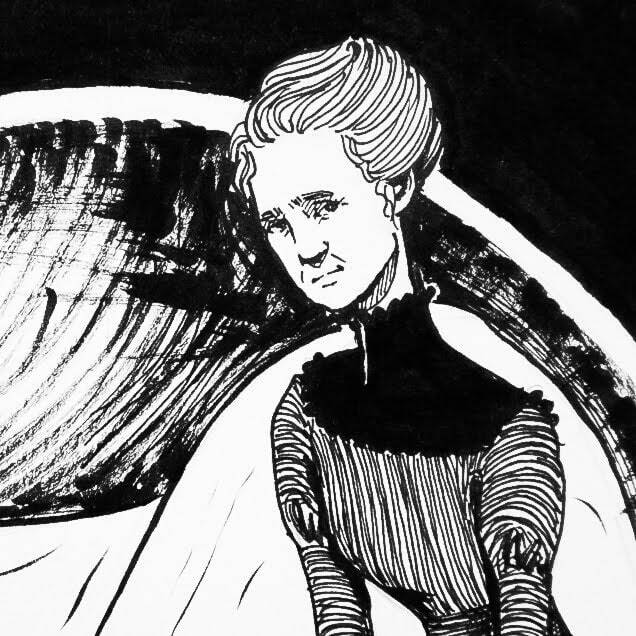 When I decided on the theme for this year Inktober, I had absolutely no doubt that I wanted to start by paying my homage to Marie Curie. I was awarded a Marie Curie scholarship to do my PhD and I am thankful to scientists that, like she had done, have fought battles to make it easier for people like me to study and build a life in the search of the unknown. I am also a proud vice-chair for the Marie Curie Alumni Association, and I hope I am doing my small share to continue fighting the battles that are left and make it easier for other researchers to follow their dreams. If you are wondering what’s going on here, I have a little explanation on this post!